Panama’s Foreign Minister Isabel de Saint Malo (left) and Chinese Foreign Minister Wang Yi toast after signing a joint communique on establishing diplomatic relations during a press briefing in Beijing, June 13, 2017. But whether bravely or foolishly, Tsai has declined to endorse the 1992 Consensus idea, and this refusal confirms what everybody on Taiwan already knows—that in her heart of hearts, like in the heart of hearts of a vast majority of her compatriots, independence for the island is the ultimate and just goal. Now, having made its warnings, China is making good on them, imposing a cost for what Beijing sees as Tsai’s unpatriotic stubbornness. Beijing has cut off official exchanges, reduced the flow of tourists, denied Taiwan the observer status it hoped to have at the upcoming World Health Organization meeting in Geneva, and imprisoned the Taiwanese activist Lee Ming-che. Now, by inducing Panama to switch diplomatically from Taiwan to China, Beijing has imposed a large dollop of diplomatic coercion, and most likely it won’t stop there. There are, of course, costs on both sides of this equation. Given the goal of reunification, Beijing has an interest in not antagonizing Taiwan’s public, reassuring it that the embrace of the motherland will not deprive the people of Taiwan of their democratic culture. There was hope, before the election, that China would, with that interest in mind, quietly accommodate itself to Tsai’s victory and what it represents in Taiwanese public opinion. But the message of the last few months is that Beijing is making a different, harder-line choice; it is enacting its authoritarian nature. For the United States, it would be have been easier had Tsai not been elected, and, once elected, to endorse the 1992 Consensus. But that hasn’t happened because of a political reality on Taiwan, consisting of widespread opposition to being taken over by China, which is what produced Tsai’s election victory—despite Beijing’s warnings—in the first place. It’s an excruciating dilemma, but in the end, American standing as a great power in the Asia-Pacific, our network of alliances in Asia, and our reliability as a strong, non-intimidated ally require us to do what Beijing refuses, which is to acknowledge and respect the preferences of the 22 million people who live on Taiwan. But this is the era of Donald Trump. If Germany’s Angela Merkel no longer feels that the United States can be relied on, what reason does Taiwan have to feel confident the United States has its back? There are plenty of things the United States could do, and ought to do, to prevent further isolation of Taiwan. Although Washington has no right to tell other sovereign states how to act on what they believe to be in their national (often economic) interest—such as, in Panama’s case, establishing diplomatic relations with China—it could certainly do more to counterbalance Beijing’s efforts to narrow democratic Taiwan’s international space. Renewed leadership as part of a coalition of likeminded democracies to ensure Taiwan secures participation at multilateral forums (a battleground where Beijing has scored several successes in the past year) would not only be principled but is also essential to global security and therefore very much in everyone’s interest. As China continues to whittle away at Taiwan’s visibility, the United States and its democratic allies should increase the frequency and level of exchanges with Taiwan (at the official and unofficial level) to demonstrate their commitment to the democratic nation, whose continued existence as a sovereign entity serves both as a source of emulation for other states and a stabilizing force in the region: the abandonment of Taiwan, and subsequent annexation by China, would embolden revisionist forces in Beijing and likely prompt rearmament from Taiwan’s neighbor Japan. Serious negotiations on a U.S.-Taiwan free-trade agreement would mitigate Taiwan’s economic jitters, benefit various American businesses, and conceivably prompt other major economies to consider similar agreements. Renewed commitment to the Taiwan Relations Act and the Six Assurances, as well as stronger, bipartisan signaling from Congress of American support for Taiwan, would also go a long way in assuaging fears of abandonment in Taipei and limit the psychological damage accruing from the loss of international space. Regarding Taiwan’s relationship with China, the loss of Panama, and possibly that of a handful more in the lead-up to the Chinese Communist Party’s 19th Party Congress later this year, exemplifies Beijing’s determination to punish Taiwan for the choices it has arrived at democratically. The rigidity that undergirds such decisions highlights both a policy failure on Beijing’s part, which is at a loss as to how to handle a consolidating Taiwanese nationalism, and suggests a future of greater instability resulting from that inability to adapt to and accept reality. Although Beijing blames the current impasse on the Tsai Ing-wen administration and will do everything in its power to undermine it, subsequent administrations in Taiwan will now also be propelled and constrained by the liberal-democratic forces that are now fully entrenched in Taiwanese society. At some point, Beijing and the international community will need to acknowledge that a stubborn effort to turn Taiwan into something that goes against its nature will only contribute to greater instability within the region. A final role for the United States, therefore, will be to make it clear that intransigence—a fixation on annexing Taiwan against its will—is the main source of instability, not a people’s right to self-determination or elected leaders who make policy decisions based on those imperatives. The Democratic Progressive Party (DPP) took back power last year on an upbeat campaign that it would “Light up Taiwan” (點亮台灣), but President Tsai Ing-wen must be feeling anything but sunny at this moment. Because most of Taiwan’s diplomatic partners are in Central America and the Caribbean, there has always been an inclination on the mainland NOT to arouse United States sensitivities by being too proactive with governments of those countries. For at least the past decade, delegations from Panama have come to Beijing, usually led by a former official to the United Nations. The Chinese host would normally be the China Association of the United Nations. Coming after Trump’s December phone conversation with Tsai, if the United States works to prevent more of the Taipei-20 switching to Beijing, it will most likely confirm suspicion that the U.S. is behind Tsai in confronting Beijing. Accordingly, response to U.S. arms sales to Taiwan will be viewed in a different light, too. Perhaps I should put it this way: the mainland side understands that the U.S. is committed to separating Taiwan from China in a military sense—it was a compromise in the 1970s. When the United States works to separate Taiwan from China in the diplomatic arena, it is a different level of confrontation, initiated by the U.S. side. The U.S. side is certainly resourceful to take action and withstand China complaints. But to what extent the U.S. wins is difficult to predict: third country governments have their own interests too; what does the U.S. offer in exchange for demanding they stay with Taipei? 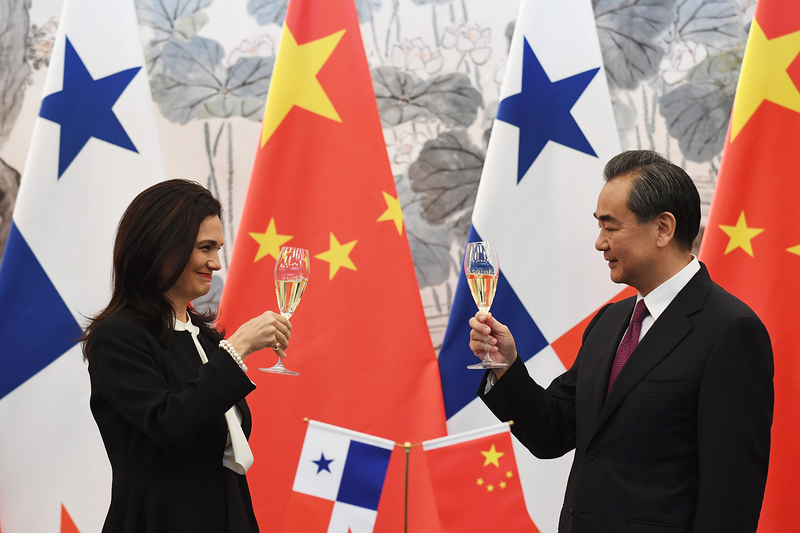 Beijing’s successful securing of recognition by Panama is, as the above responses note, clearly intended to punish the Tsai administration for its failure to endorse the “1992 Consensus.” Serving as a stark counterpoint to the unprecedented, baijiu-infused bonhomie of the 2015 Xi-Ma summit, the latest move drives home the point that China will act aggressively to impose costs against any policy of overturning the “One China” framework laid out in the Consensus. As in other matters that are seen as implicating China’s territorial sovereignty, such as the handling of Hong Kong “localists” or the South China Sea island disputes, the Communist Party is not prepared to give the slightest sign of laxity or leniency in prosecuting its claims. There are arguments to be made—indeed they are made, above—that the United States should do more to engage with Taiwan economically and diplomatically, to promote its inclusion in international forums, and to deter Chinese attempts to further isolate it. Certainly, Taiwan deserves such engagement and support. Prosperous, democratic, stable, one of the most liberal societies in East Asia, with unique historic ties to the United States, and sitting opposite America’s greatest geopolitical competitor, it almost seems as though there is nothing Taiwan could do to make itself a more attractive target for America’s strategic benevolence. But such support should not extend to aiding the Tsai administration in its attempts to find an alternative to the “1992 Consensus.” To the contrary, the Consensus has proved its value in helping to make possible economic and social exchanges between Taiwan and the Mainland while leaving the insoluble dispute over sovereignty in a state of ambiguity. Like many international agreements, the Consensus is an unlovable product of awkward wording and compromised ideals. Yet such compromise is infinitely preferable to a scenario in which both China and Taiwan’s authorities pursue their incompatible sovereignty claims into increasingly intense conflict or even outright warfare. Tsai and others in the D.P.P. have promoted independence-oriented politics with arguments about the “right to self-determination” of Taiwan’s people, or, even more vaguely, about the development of “Taiwanness” and “Taiwan subjectivity.” But an elastic norm of “self-determination” does not by itself solve the problem of what happens in concrete disputes over autonomy, as indicated by the different positions of the U.K. towards Scotland and Spain towards Catalonia (let alone more geopolitically sensitive cases like those of Kosovo or Crimea). Needless to say, discussion of “subjectivity” is even less helpful. Sovereignty is not a subjective matter, but rather the objective question par excellence: Who makes the decisions in a particular space? In practice, Taiwan’s authorities have since 1992 continued to “make the decisions” on all significant domestic policy and most aspects of foreign affairs. In doing so, they have ensured the political rights and material well-being of their citizens. Pursuing romantic visions of a self-actualized “Taiwanness” may put these concrete achievements in jeopardy. The U.S. should deepen its friendship with Taiwan while prioritizing regional peace and prosperity, which is better ensured within the framework of the Consensus than in quixotic searches for emotionally authentic politics. With its platform of inclusivity and social justice, the D.P.P. can do much good for Taiwanese society without focusing on the trappings of nationhood. Panama's sudden decision to severe diplomatic ties with Taiwan and recognize China is a serious setback for Tsai Ing-wen. It marks the third diplomatic ally to flip (following the Gambia and Sao Tome and Principe) under her leadership, and comes shortly after Taiwan failed to receive an invitation to the World Health Assembly in May, for the first time since 2009. Under her predecessor Ma Ing-jeou, the leader of the KMT, Beijing and Taipei had reached a diplomatic truce not to try to poach the other's allies. That understanding appears to have been abandoned with the DPP's election. There are already signs that as Taipei feels increasingly isolated, it is beginning to re-evaluate its approach to cross-Strait relations. In the long-run, however, Beijing’s actions may prove counterproductive and unsustainable. Chinese coercion has proven ineffective in the past in enticing Taiwan to stop moving away from it. In fact, it has done just the opposite -- the identity foundation for unification has evaporated in Taiwan in recent decades. How Tsai and Xi manage cross-Strait relations after the 19th Party Congress will be among the most important developments for Asia this year. Last week, Panama switched its diplomatic recognition from Taiwan (Republic of China, R.O.C.) to China (People’s Republic of China), ending its long official relations with the R.O.C.. Why this happened and how Taiwan should respond have been widely discussed, but few have covered this episode from the perspective of regional stability in East Asia. In short, the Panama episode may be the tipping point of the current delicate regional peace in East Asia. The Panama episode does not change Taiwan’s status of being a de facto self-ruled island. There is a prevalent view among experts that a political entity’s sovereignty is constituted by foreign recognition. However, this view is disputable. It can hardly be argued that North Korea is not a sovereign country because it lacks diplomatic recognition from many Western countries. Whether or not a political entity is a sovereign country should be determined by its ability to govern internally as well externally, not by its diplomatic ties. The Convention on Rights and Duties of States has defined “the state as a person of international law should possess the following qualifications: a) a permanent population; b) a defined territory; c) government; and d) capacity to enter into relations with the other states.” From this perspective, even if Taiwan lost all of its official diplomatic ties, which is highly possible in the years to come, the ability of the Taiwan government to govern its citizens will still be sound. What has been changed by the episode, however, is Tsai Ing-wen’s determination to normalize her country. Tsai has been carefully following a de facto ”’92 consensus” since assuming office in 2016. Some believe China’s recent encroachment on Taiwan’s international space is because Tsai refused to accept the ’92 consensus. This assertion, nevertheless, is only partially correct. For the previous government of Taiwan which was ruled by the Kuomintang (K.M.T. ), the ’92 consensus meant “one China, different interpretations”—Taiwan upheld its existing R.O.C. Constitution that Taiwan is not a separate political entity from the Chinese mainland. China’s tacit agreement with this version of the ’92 consensus in the meantime also helped to maintain a special modus vivendi between Taiwan and China. It cannot be said Tsai has refused the ’92 consensus in any substantive way because there is a great deal of clear evidence showing Tsai has accepted a de facto ’92 consensus in order not to provoke China. Following a message from Chinese Foreign Minister Wang Yi in February 2016 hinting that Taiwan should uphold this constitution, Tsai appointed non-Democratic Progress Party (DPP) politicians as Foreign Minister and Minister of the Mainland Affair Council, refrained from mentioning Taiwanese sovereignty in public, and used the term “Chinese mainland”, not China, in relevant official statements. Tsai, as a president from the DPP, has been playing a key role in upholding the constitutional status quo of Taiwan. The Panama episode has intensified a heated policy debate within the Taiwan society. Tsai’s policy of obeying the de facto ’92 consensus has been challenged from within and without the DPP. On the one hand, there has been a strong voice from important DPP members and young Taiwanese since 2016 to change the name of their country or to amend or even abandon the unsuitable R.O.C. constitution, which awkwardly claims that the sovereignty of the vast Chinese mainland belongs to the small island of Taiwan.Koo Kwang-ming, a critical pro-Taiwan independence figure in the DPP, points out “(now) only 20 countries—whose populations are smaller than Taiwan’s—in the world recognize the R.O.C.. What is the meaning of their recognition of the R.O.C. ?” Not surprisingly, only 3% of people in Taiwan regard themselves as Chinese. For them, what Panama abandoned is just an empty shell of the R.O.C., and getting rid of this unfitting shell is the only way to solve the current diplomatic quandary of Taiwan. The inherent problem of this logic, however, is—is it correct to assume China will stop pressuring Taiwan simply because Taiwan changed to another shell? On the other hand, Wu Den-yih, the chairman of the K.M.T., echoes the position of China and proposes that accepting the ’92 consensus is the only way to stop China’s unfriendly actions toward Taiwan. The logic, however, is self-defeating. What China has forced Tsai to accept now is China’s version of the ’92 consensus — that Taiwan belongs to the P.R.C.—and not the previous version of ’92 consensus, which left Taiwan some room to interpret its meaning. If history can offer any insight, it is very possible that Tsai’s new policy toward China will become much more pro-Taiwan Independence. The current dynamic across the strait is very similar to the dynamic of 2000–08, in which China was unresponsive to many olive branches extended by a Taiwanese president from a pro-independent party. In the end, the president had to embrace pro-Taiwan independence groups to increase domestic support. After a series of China’s hostile actions toward Taiwan, Tsai may ultimately give up on being a buffer between Chinese and domestic pressure, thus further embracing what brought her to the presidential office in the first place—a strong pro-Taiwan independence sentiment in Taiwan society. The most obvious clue is her statement responding to the Panama episode. “We are a sovereign country… I also want to use this opportunity to declare to Beijing: Taiwan has already upheld our responsibility for maintaining cross-strait peace and stability. In contrast, China’s actions have challenged the cross-strait status quo. This is unacceptable to the people of Taiwan. And we will not sit idle as our national interests are repeatedly threatened and challenged.” This is the first time she officially and publically asserted to China that Taiwan is a sovereign country. Certainly, it is impossible for Taiwan to win a diplomatic war against China, but it can present China with a number of insupportable costs. One major difference between now and 2000–08 is that the issues of Taiwan, the East China Sea, and the South China Sea have become closely interlinked. China’s sovereignty claim on the disputed islands in those areas has been largely grounded on the legitimacy of the R.O.C., and Taiwan’s technical silence on its sovereignty claims over those areas indirectly supporting China’s claims. Any small amendment to R.O.C. constitution on its sovereignty claim could make China suffer an unwanted regional military conflict, which it is eager to avoid. To gain quid pro quo from China, Tsai refrained from challenging or disputing China’s claims on the South China Sea during and after the Philippine’s lawsuit against China. The same applies to the Diaoyu/Senkaku Islands issue. However, Tsai’s patience with China appears to have run out. She has made it clear that it is time to review the current cross-strait policy. Panama might not see the likelihood of a military conflict over the South China Sea and East China Sea when severing its diplomatic ties with the R.O.C..